It took the threat of an embarrassing Super Bowl ad, but Hershey is finally starting to act like it gives a damn about forced child labor being a major ingredient in its cocoa. The company recently announced it would start buying only Rainforest Alliance-certified cocoa for its Bliss Chocolate products starting later this year. The Rainforest Alliance is a reputable nonprofit whose certification system will help ensure that the cocoa is grown sustainably, which includes the monitoring of forced and child labor. Coincidentally, Hershey's change of heart (after a decade of foot dragging) came a week after Raise the Bar campaign partner the International Labor Rights Forum announced its intention to broadcast a JumboTron ad critical of Hershey's cocoa supply chain outside the Indianapolis stadium where the Super Bowl took place. But hey, sometimes it takes a stick rather than a carrot. I just hope the company quickly moves to certify the cocoa for its regular bars, not to mention its other brands, like Reese's, KitKat, and Almond Joy. In other positive Hershey news, GreenBiz.com reports that the chocolate maker has achieved zero waste at four of its Pennsylvania facilities. However, I'd be more impressed if they weren't incinerating the 10 percent of their waste that is organic. Why not go for industrial composting? I rarely buy Hershey's chocolate, as I prefer the really dark stuff (which Hershey's doesn't make). But a bigger-picture reason to not give the storied American brand your money is that it sources much of its cocoa from Ivory Coast, where forced child labor is rampant in that industry. Hershey's, which commands 42.5 percent of the U.S. chocolate market, isn't doing a very good job, compared with its competitors (such as Cadbury/Kraft, Mars, and Nestle), of tracing cocoa purchasing and implementing labor rights standards in its supply chain. In fact, it's doing next to nothing. Which is why it's the target of the "Raise the Bar, Hershey!" campaign, sponsored by nonprofits Green America, Global Exchange, and the International Labor Rights Forum. I've always been a sucker for culture jamming, so I was pleased to see that a central part of the campaign was a "brand-jamming" contest. The winners were announced a couple days ago. I rather like Jason Pearson's winning entries in the "overall brand jam" (video below) and print ad (above) categories. Enjoy! And if you'd like to send Hershey's a message yourself, you can do so here (via Change.org). I have to put up a quick plug for a new website by flour maker Stone-Buhr. Full disclosure: The company just paid me to write some copy about it on their packaging. But it's very cool and exactly the type of thing that I'm interested in! It’s an interesting piece, but I found it odd that the opening description—of Patagonia environmental analysis director Jill Dumain “investigating,” camera in hand, one of the company’s T-shirt suppliers—was never followed up on to reveal what the investigation was for. Had the Footprint Chronicles found a supplier with dirt on its shoes? Oh well, no juicy skullduggery to report. But it’s good to know they’re on the lookout. Speaking of transparency, outdoor-sportswear maker Patagonia has pulled back the curtain on the environmental effects and manufacturing processes behind some of its clothes with a cool new web feature. The Footprint Chronicles tells the life story of five Patagonia products, showing the path each travels from design through fabric acquisition and processing, and finally to the distribution center. Each stage of the process has a thumbnail photo that you can click on for additional reading or videos on specific factories, sourcing philosophy, etc. And each product’s page details the total distance it traveled, its CO2 emissions, the total amount of waste it generated, and its energy consumption. But I must confess that my first reaction to the data behind the curtain was tinged with disappointment. The Wool 2 Crew sweater, for example, travels a total of 16,280 miles (thanks in part to its wool’s origins in an eco-friendly New Zealand ranch), generating 100 times its weight in carbon dioxide emissions. As the webpage itself states, “This is not sustainable.” And the Synchilla vest, which is (happily) made from all recycled materials and is itself recyclable through Patagonia’s Common Threads program, still generates 44 times its weight in emissions, despite the fact that its mileage figure of 5,150 is significantly less than the crew’s. First reaction aside, though, I applaud Patagonia for launching the Footprint Chronicles and being willing to give us the straight dope. That in itself speaks volumes about the company’s ethos—clearly, it’s genuinely interested in engaging with consumers on these issues rather than making vague claims of responsibility and then hoping no one asks for elucidation (like some companies). Personally, I’m more likely to buy a jacket whose environmental footprint I can know something about than one that’s shrouded in mystery. Furthermore, it’s good for consumers to be educated about what a globalized economy looks like. Certain products may be better than others in certain regards, and certain companies may have a higher commitment to lessening their impact on the earth than others, but the fact is that most products zip around the globe, merrily generating waste, warming the atmosphere, and expending energy before they land on store shelves. The more people realize this, the more attention will be paid to making smart choices given the current realities. One thing I was excited to see, in several of the Footprint Chronicles product pages, was reference to a third-party auditing firm. To get more details, I talked to Nicole Bassett, Patagonia’s social responsibility manager. Turns out Patagonia works with a number of different auditors, not just Global Standards (which is misidentified as Global Solutions on the website). “We want to work with local auditing firms as much as possible because of their knowledge of local law and language,” she said. So are all of Patagonia’s factories being constantly audited? Not exactly. Bassett herself schedules the audits “when we want to know about a factory’s social compliance.” (I meant to ask how often that happens and what the triggers are, but didn’t). An audit is scheduled for each new facility that the company starts using, Bassett said, and she also checks on factories that have been in Patagonia’s supply chain for years. While I had her on the phone, I asked why the Footprint Chronicles had such scarce information on the natural-latex components for the Honeydew shoes. The reason is that the shoes are actually made by a company called Wolverine. “We just don’t really have the expertise in shoes,” Bassett explained. “So we license our brand name to Wolverine,” and Patagonia simply hasn’t been able to get all the numbers from Wolverine yet. Bassett said she expects the information to be available on the next version of the Footprint Chronicles, which should come out in April, and should also include four more Patagonia products. Hooray for transparency! Adidas has made its list of global supplier factories public. (And I just learned that Nike did the same thing way back in 2005.) The move has been lauded by the International Textile, Garment and Leather Workers’ Federation, Oxfam Australia, and other civil society groups—many of which lobbied the companies extensively over the years on this issue, so they deserve congratulations too. Any move toward greater corporate transparency concerning supply chains deserves kudos, in my book. My last post points to the issue of sweatshops overseas, but as this article on the Florida fruit-picking industry shows, the U.S. has exploitation problems of its own. Toward the end of the story, the reporter mentions a campaign waged by the Coalition of Immokalee Workers, a local advocacy group, to get major buyers to pay a penny extra per pound of tomatoes in order to improve the lot of the workers. McDonald’s and Yum Brands (which owns such chains as KFC, Pizza Hut, and Taco Bell) have agreed to the plan, but Burger King refuses, using the familiar old “we don’t employ them, so they’re not our problem” rationale. It’s a pretty tired excuse in a day and age when corporations are increasingly expected to take responsibility for the unethical practices of their suppliers by getting them to either change their evil ways or say adios to all those fat purchase orders. Still, I wasn’t particularly surprised. But I was shocked to read that Whole Foods Market “has been discovered stocking tomatoes from one of the most notorious Florida sweatshop producers” and that it, like Burger King, had also refused to pay the extra penny per pound. Clearly, more investigation is warranted. Pumpkins are sprouting up on front steps, and synthetic spiderwebs are spreading throughout windows and doorways in my neighborhood. In a week, trick-or-treaters will blanket the area to collect all manner of sugary confections. But just as Halloween has a dark side (from its origins in warding off evil spirits to such present-day irritants as oversexualized kids’ costumes), so do all those sweets. Top candy manufacturers such as Hershey’s, Mars, and Nestlé—the makers of most of the treats that will fill those bags on All Hallow’s Eve—have long been criticized for sourcing their cocoa from West African producers with unsavory labor practices. Chocolate isn’t the only culprit, of course; social and environmental injustices can lurk behind other ingredients and in other parts of the supply chain as well. There are some signs of progress: Hershey’s and Nestlé, for example, have signed on to the International Cocoa Initiative, and Hershey’s this year worked with Verité and Business for Social Responsibility to create a code of conduct that addresses fair-labor practices as well as the environment and food safety in all its suppliers. But many conscious consumers are still understandably wary of Big Candy. Then there’s the health aspect of the annual feeding frenzy; the statistics on childhood obesity today are nothing if not worrying. 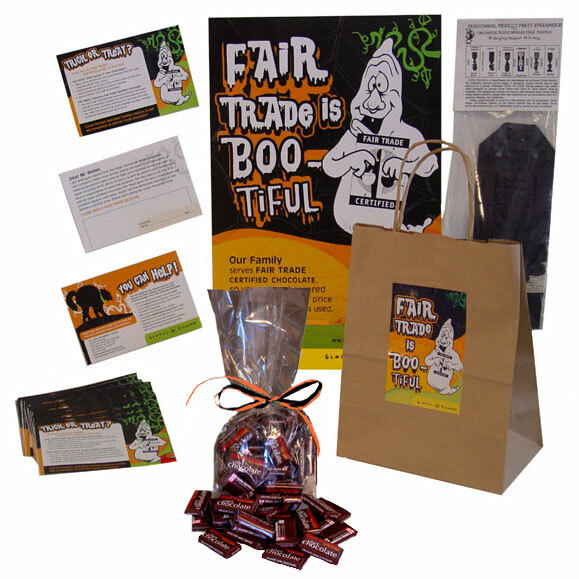 Meanwhile, Global Exchange is publicizing reverse trick-or-treating, in which costumed kids give fair-trade sweets and informational postcards to the households they’re supposedly hitting up. I tend to share World Changing’s skepticism of just how fun this would actually be for the little tykes, but hey, it’s worth a try. In any case, I like the fact that so many people are “thinking outside of the candy box” (to quote Green Halloween) this year. Hmm, Mr. Wallet Mouth and I have a bunch of leftover blinky dice we had made as gifts to hand out at Burning Man; perhaps those would make good treats (not for compulsive swallowers, though). At the very least, we’ll have to scare up some fair-trade chocolate.